"How do I permanently delete contacts from my iphone?" Whether you want to delete a single contact or all contacts from your iPhone, the process to do it is pretty easy. You can do this quickly and easily via number of methods. No matter which method you choose, it is recommended that you permanently erase them from storage afterwards so that they become unrecoverable. Using the official Contacts app is an ordinary way that most people use to delete their iPhone contacts. This contact deletion method involves a few simple steps. Launch Contacts app on your iPhone and find the contact that you want to delete. Now select that contact and tap Edit. A number of options will appear. Search and find the Delete Contact option and then select it. You will be asked for confirmation, tap Delete Contact to confirm your action. Your selected contact will be deleted after this. If you have connected your iPhone to your iCloud account, then the contact will be deleted on all your connected devices. Contacts deleted with this method are not permanent and can be easily found via professional tools such as iMyFone Umate Pro. In order to permanently delete your iPhone contacts, you will need to use a good iPhone data erasing tool. 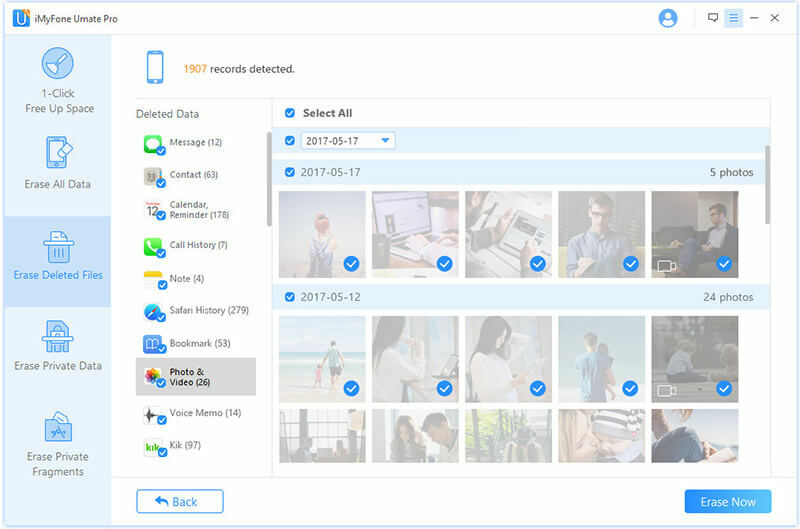 iMyFone Umate Pro is one of the best iPhone data erasers that you can use to quickly and permanently delete contacts from your iPhone. Apart from deleting contacts, this useful tools offers plenty of additional features. Permanently delete contacts from iPhone and make them 100% unrecoverable. Umate Pro also allows you to preview contacts before deleting them. If you have already deleted your iPhone contacts, then Umate Pro allows you to make them unrecoverable by permanently erasing their traces from your iPhone storage. 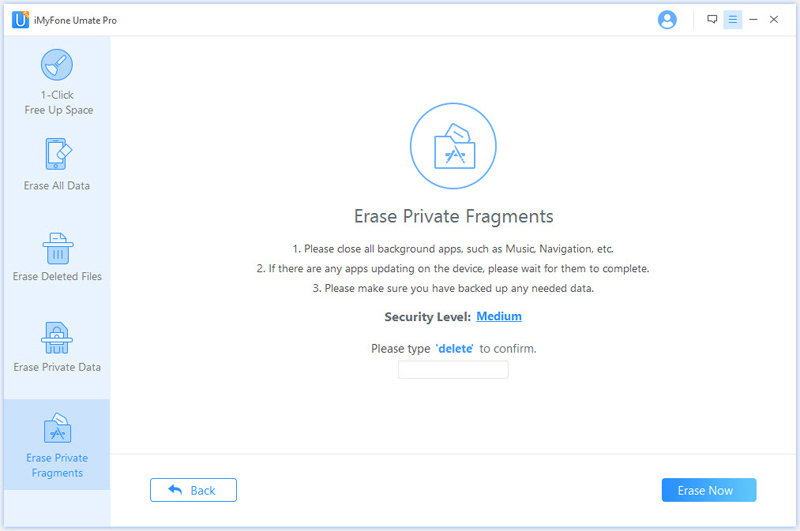 Apart from contacts, you can erase any type of data with this tool including fragments left by third-party apps. Umate Pro is the best tool for quickly freeing up your iPhone storage via 1-Click Free Up Space feature. Launch Umate Pro on your Windows PC or Mac and connect your iPhone via compatible lightning cable. Select Erase Deleted Files tab on the software and click on Scan button. 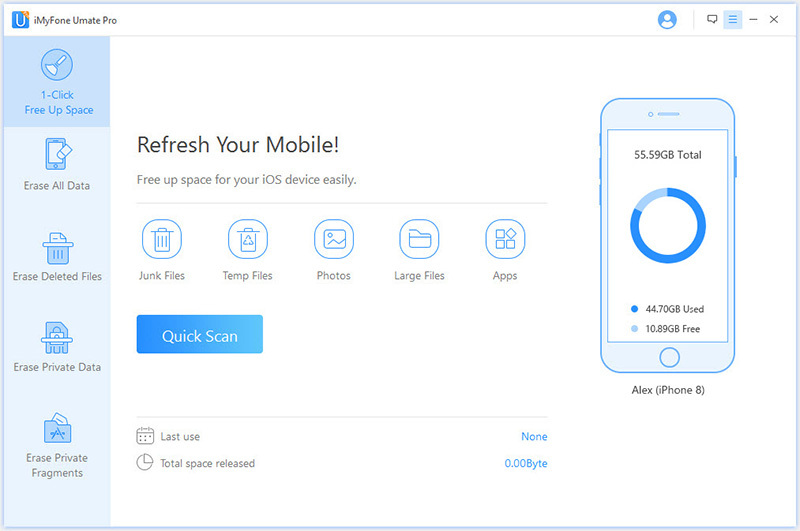 Umate Pro will scan your iPhone for deleted files. Now preview the contacts that you already delete and click on Erase Now button to permanently erase these contacts. Select the security level (from low, medium, high) and type ‘delete’ in the textbox provided on the screen. After that, click on Erase Now. Your selected contacts will start deleting permanently. 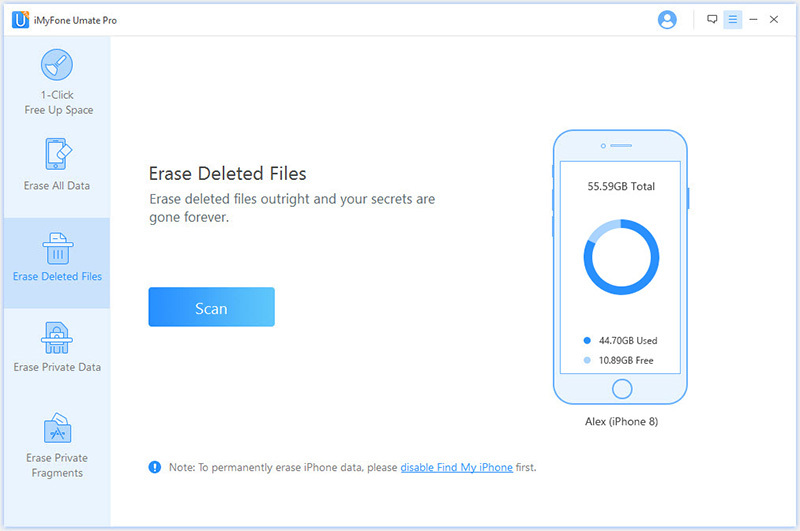 Data deleted by Umate Pro is 100% unrecoverable so you won’t have to worry about any privacy leak once you delete your iPhone contacts with this tool. 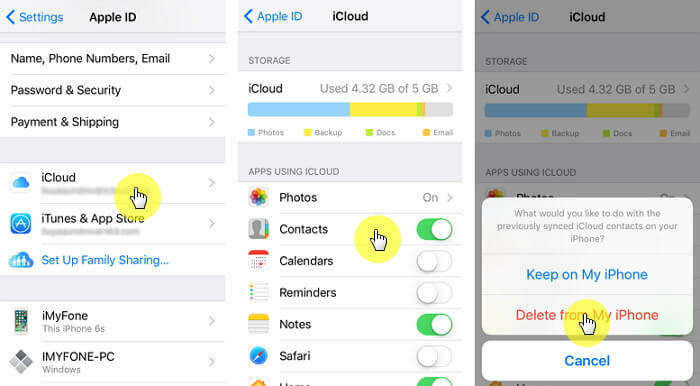 You can delete all your contacts from your iCloud account by following some simple steps. Keep in mind that deleting contacts from iCloud will delete them from all your connected devices that have iCloud Contacts turned on. Step 1: Launch Settings app on your iPhone and tap your Apple ID (sign in if you haven’t already). Step 2: Now navigate to iCloud and turn off the Contacts option. Once you do this, a deletion message will appear telling you that the contacts on your iPhone will be deleted. Step 3: Select Delete from My iPhone option. The deletion process will start.